What an awesome birthday gift for dear David. 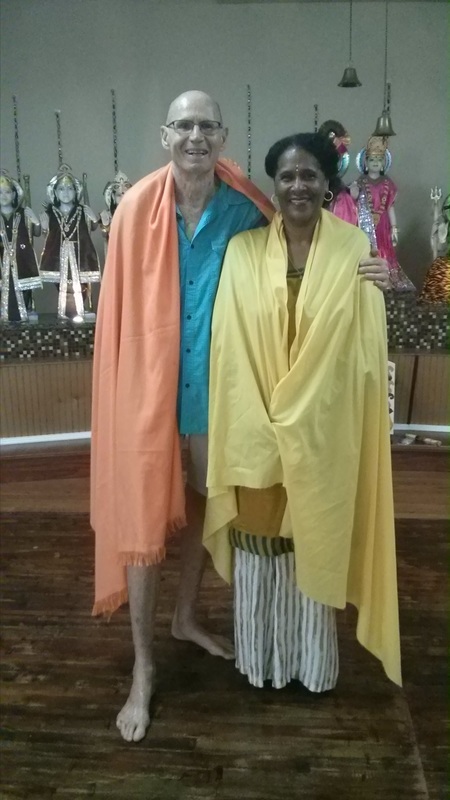 Last Sunday David attended his Bhagavad Gita class at the Yoga Shakti Ma Ashram. To his delight he met Swami Krishna from the Sri Pranavanandaji lineage. 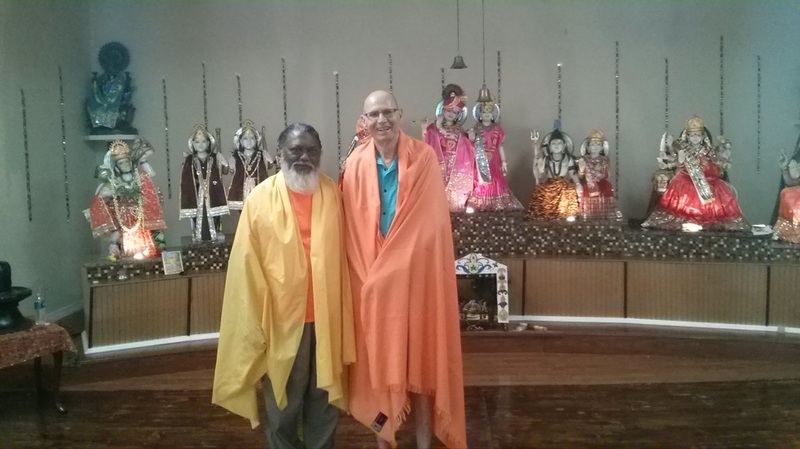 Swami Krishna is the Pundit at the Brevard Hindu Madir, temporarily filling in for Pundit Deo who is taking a leave of absence for a year. Swami Krishna shed illumination on the venerated passages of the Bhagavad Gita and contributed greatly to the Sunday Satsang. 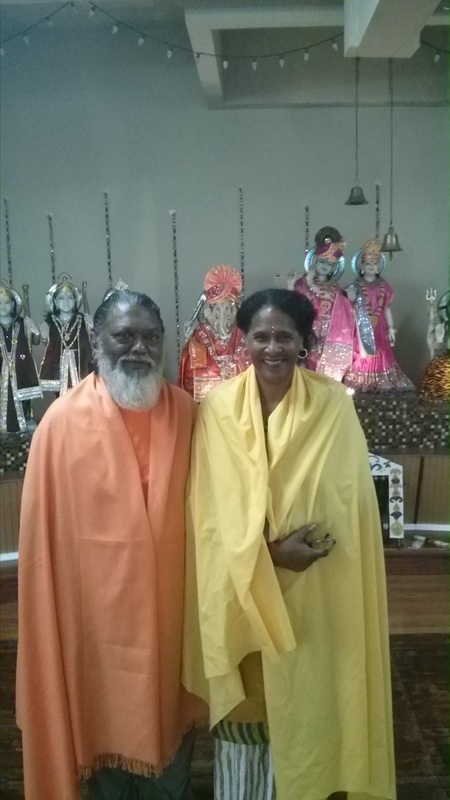 Today, he graciously allowed us to visit and enjoy further satsang with him at the Brevard Hindu Temple. Swami Krishna is a dynamic, passionate devotee of God. He is broad minded and tolerant. We discussed the necessity for a more universal approach to religion and race. Swami Krishna fervently advocates a focus on seva/service to mankind. He is very much an admirer and lover of Bhagavan Sri Sathya Sai Baba and in fact often reiterates Sai Baba's famous quote: "Love All, Serve All", adding the words "Respect All" for good measure. As we talked at length about his Guru and lineage, I kept noticing a radiant glow of blue around Swami's hands and arms. The name Krishna was very appropriate for him! The Brevard Hindu Mandir has undergone an amazing transformation under Swami Krishna's care. He has planted a charming garden and installed a water fountain and gazebo. The Temple sits adjacent to the Indian River with its sultry, tropical breezes adding to the lush view. Swami Krishna offers a Sunday program and on Tuesday, Hanuman Chalisa is performed. Swami gave David and myself a special birthday blessing. pouring holy water in our hands and offering flowers and incense to the deities lining the auspicious altar. At the conclusion of the blessing he tied our wrists with red thread. Swami Krishna asked me if I liked to sing bhajans. Of course, we all then sat and sang bhajans. I sang "We Are Blessed", after which Swami belted out a very passionate and spirited "Jaya Jagadeesa Hare." Om Sai Ram! Thank You Swami for Blessing David & I so abundantly! We Love You Baba!